I'm very fortunate to have many stand out moments in my life. It's not that I lead some rock star life (though my life for years now, has been great). It's more that I'm able to really make something memorable out of a somewhat mundane experience. Take for instance, watching Hoosiers at the IMA's summer nights series. The IMA summer nights movie series, for the uninitiated, is great in part due to the classic movies they play. Classics like Gone With The Wind, Aliens, and The Breakfast Club are examples of movies that have played to audiences over the years. These movies are the absolute classics of my generation. That's the great thing about modern movies. Old movies are not lost on the newer generations. Each generation ahead of us is lucky to have yet another generation worth of classic movies to enjoy and add to their personal library. The annual event at the IMA is also memorable because of the venue. You're watching movies in quality Indiana summer weather, i.e. heat and humidity. The outdoor amphitheater itself is relatively secluded and quite. Because of its popularity and first come, first serve seating you have to get there early. This only means that you have to bring a lot of food to picnic with and drink lots of SunKing to wash it down. But what is probably the most appealing aspect of this annual movie season is the audience it draws. These movies attract the super fans, the fans that know every line and are there to watch the flick for the hundredth time. 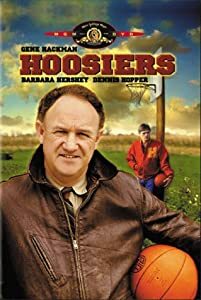 Hoosiers is no different. Allison and I had shipped the kids off to my parents farm, had our delicious spread of food before us, and reveled in the nostalgia. While I obviously didn't grow up in the period of the movie, Indiana basketball was engrained in my person. Because of my parent's ties to the school system, we attended every home Jay County boys basketball home game. I'd been to the largest and second largest high school gyms in the world numerous times, New Castle and the now shuttered Anderson Wigwam, and didn't think much of it. The final game of the movie is based on a game against the 'big city' Muncie Bearcats, a neighboring rival the Patriots played annually. I've been a part of a community that rallied around its high school basketball team. I'm now rambling on about some alleged street cred to paint myself as some expert in high school basketball and to a point, I'm right. But that's the beautiful thing about this one evening at the IMA, I wasn't alone. Countless others in the audience are able to say the same story, slightly tailored to their hometown. As you would guess, there was cheering during the movie. lots of it. And you know that slow clap scene in the locker room? Yeah, we did that too. There was the guy sitting next to us explaining the importance of Indiana high school basketball and the pertinent scenes to his woefully ignorant, likely out of state college girlfriend. We didn't mind the tourist, we were attending an evening worship service and all were welcome. We were Hoosiers watching Hoosiers and it was a glorious night. I saw this movie in the theater with my older sister when we were kids. She told me what was going to happen before every. single. scene. But I loved it anyway. p.s. This fall, Indy Film Fest is screening Blair Witch outside at the IMA!